Illegal hunting is a scourge on rural communities in NSW and tarnishes the reputation of ethical, responsible hunters. The DPI Game Licensing Unit works closely with Police to detect and deter illegal hunting in NSW, to the benefit of the community. 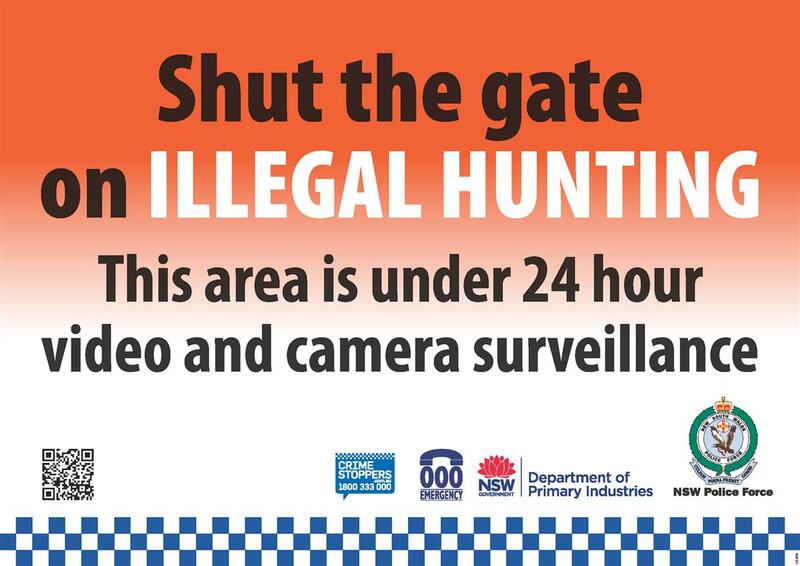 The Shut the gate on illegal hunting program, in partnership with the NSW Police Force, is part of a larger campaign to shut the gate on rural crime in NSW. Shut the gate gives the community the ability to report illegal hunting and notify agencies of an issue. Managed through Crime Stoppers, you can either phone (1800 333 000) or use the online form to quickly and easily submit your report, which will be sent to both NSW Police and DPI for action. Remember, in an emergency always call 000. Download the DPI Game Licensing Unit's Get Permission App today! 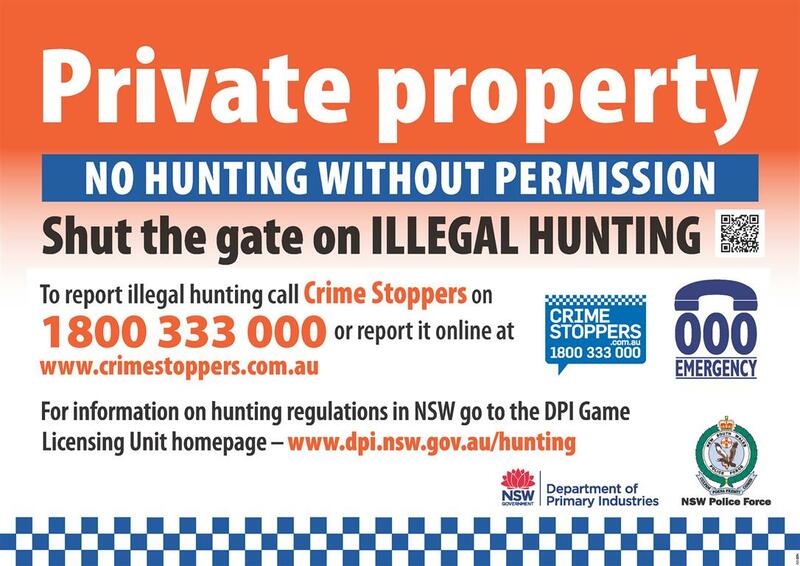 Created in partnership with the NSW Police Force, Get Permission is another tool to help hunters, landholders and local communities to Shut the gate on illegal hunting. Get Permission connects hunters with landholders, allowing them to manage permissions to hunt on private land using a simple interface. Keep your records in one place, store important documents and provide your permissions to authorities when requested. Private and secure ‐ your permission requests, approvals or denials are only stored on your phone ‐ DPI and the NSW Police Force do not have access to view activity across the app. easily request permission to hunt from landholders. email copies of your permissions. email copies of permission requests. Download the App today from the AppStore or GooglePlay. Read Primefact 1632: Get Permission with the new App for more information. You can also read some Frequently Asked Questions about the App. stray hunting dogs, often without a microchip or a collar without identification. Primefact 1498: Shut the gate on illegal hunting discusses the program in more detail, including what to look out for and the best information you can provide. Primefact 1508: Using infrared surveillance cameras gives landholders information on how to purchase and use an infrared surveillance camera to track rural crime on their land. New signs are being placed in State forests around NSW, advertising the program. There's also a new Private Landholder Kit containing private property signs, stickers and a range of other useful information to enable prompt reporting of incidents. If you know a landholder who is affected by illegal hunting, have them get in touch with us. We'll arrange to send them a Shut the gate on illegal hunting landholder kit. If you would like a sticker for your car, ute, trailer or gun safe, email game.licensing@dpi.nsw.gov.au and we’ll get one to you.